We’d love your help. Let us know what’s wrong with this preview of A Season of Change by Lynette Sowell. Natalie never th Amish widower Jacob Miller believes it was a mistake to visit the Amish village of Pinecraft for winter vacation, especially after his daughter is struck by a car. Stranded in Sarasota until his daughter recovers, Jacob grows increasingly wary of events that unfold in his unfamiliar surroundings—including the strange curiosity of Englischer Natalie Bennett. To ask other readers questions about A Season of Change, please sign up. I have read many Amish novels and have enjoyed most of them. I thought that they all were bit the same and they usually ended the same. But this one had some twists and turns that I didn't expect. First of all the Amish man, Jacob Miller, has lost his wife after the birth of two children. He is alone and a lonely. The Amish community would love to see him remarry and there are many candidates. But Jacob has not decide yet that it is time to move on. The scene of the story is not in Amish country. I have read many Amish novels and have enjoyed most of them. I thought that they all were bit the same and they usually ended the same. But this one had some twists and turns that I didn't expect. The scene of the story is not in Amish country. While Jacob Miller and his two kids are from Ohio and an Amish community they have traveled to Pinecraft, Florida, to see his in-laws and allow the children to have time with them. While they are there his daughter Rebecca is hit by a car while cross the street and serious injured. She is take to the hospital to set a broken femur and to access any neurological issues. While in the hospital a young women comes in dressed like a clown to try and cheer her up. She does this all the time on the Pediatrics ward. It is Christmas and she wants to do something special. Natalie Bennet is a wonderful young woman with a heart of gold. But the Amish clan captures her heart, for more reasons than just tragedy. It seems as though Natalie Bennet's mother has roots in the Amish community. Her mother fled the Amish and joined the circus and became quite the acrobat. Natalie has found this out and wants more about the roots of her mother, Katie Yoder. She starts asking questions and becomes friends with Jacob's family. To make a long love story short, things progress and develop, but Natalie is not ready to leave the English lifestyle and Jacob is prone to hold to his Amish beliefs. So, what will happen. That answer will come as you read the book. The writing is very good. Just when I thought an Amish story could have a new twist, here it comes. An Amish community living in Pinecraft, Florida. A world away from Ohio and their roots. Now stuck in this community for six months while his daughter heals, what will Jacob do and how will Natalie handle things. I liked the premise, I liked the setting and felt that Lynette Sowell wrote a very compelling story that is so close to reality that it makes you feel that it actually happened. I loved the writing, I loved the characters, I loved the plot. "A Season Of Change" by Lynette Sowell is a really really good book. "A Season Of Change" by Lynette Sowell kept me turning the pages to see if Englischer Natalie Bennett and Amish widower Jacob Miller could somehow overcome their different worlds and be a couple. The attraction was there from the begining. 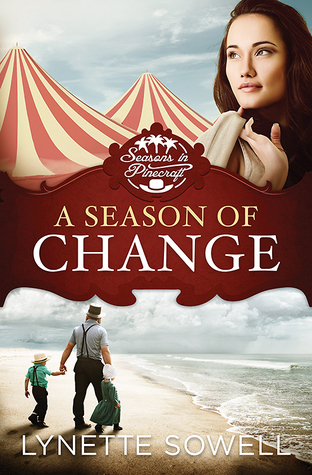 "A Season Of Change" by Lynette Sowell is the first book in the "Seasons in Pinecraft" series. Jacob Miller and his children are on vacation in the village of Pinecraft in Sarasota, Florida,a "A Season Of Change" by Lynette Sowell is a really really good book. Jacob Miller and his children are on vacation in the village of Pinecraft in Sarasota, Florida,a real place. While there an accident happens that puts Jacob's daughter in the hospital and there they meet Natalie who is a teacher for circus performers. But Natalie learns that her mom has kept a secret from her. It is this secret that changes Natalie's life. This book has many life lessons that we can learn, like how is the two sides of a coin like God? If you want to know you have to read the book. Have I convinced you to read it yet? This book has characters that you want to hug, and characters you want to yell at. It has you questioning some things and makes you think am I like this or would I do it the same way that the character in the story did? I have to admit that I am happy the story ended the way I did but I honestly didn't see it ending that way but it was a perfect ending! This book was a book that was chosen for an online book chat and the book was brought more alive and personalized because the author Lynette Sowell joined the discussion. I was given a copy of this book for an honest review by Abingdon Press . I have given"A Season Of Change" by Lynette Sowell five stars. A Season of Change is a unique Amish story that is filled with a fresh plot line. Within its pages, you will find quite the twist of unusual characters and events. I really enjoyed the fresh approach in an Amish fiction. I also enjoyed the familiarity of a nearby Ohio Amish community. Lynette Sowell does a very good job of sharing the likes and differences between the Amish, Mennonite, and Christian faiths. Comparisons are also made between the Pinecraft community in Florida and other Amish commu A Season of Change is a unique Amish story that is filled with a fresh plot line. Within its pages, you will find quite the twist of unusual characters and events. I really enjoyed the fresh approach in an Amish fiction. I also enjoyed the familiarity of a nearby Ohio Amish community. Lynette Sowell does a very good job of sharing the likes and differences between the Amish, Mennonite, and Christian faiths. Comparisons are also made between the Pinecraft community in Florida and other Amish communities. I felt the author did a good job of including those likes and differences within the story as well as in an additional author’s note. I was disappointed in Abingdon Press in the poor editing of the book. There are several spelling/grammatical errors within the book. A copy of the book was provided to me by the publisher in exchange for my honest review. All thoughts and opinions are my own. A Season of Change (book 1) was a very pleasant book to read. I couldn't put it down and read it for many, many hours. I like that the book takes place in Pinecraft, a town in Sarasota, Fl. I have been wanting to visit there for years but have not had the chance yet. Some of the characters became real to me as I picture who there really are and the places mentioned I have heard of them. I may not have made it to Pinecraft yet but the author has given me the pleasure of being there by reading her A Season of Change (book 1) was a very pleasant book to read. I couldn't put it down and read it for many, many hours. I like that the book takes place in Pinecraft, a town in Sarasota, Fl. I have been wanting to visit there for years but have not had the chance yet. Some of the characters became real to me as I picture who there really are and the places mentioned I have heard of them. I may not have made it to Pinecraft yet but the author has given me the pleasure of being there by reading her book. Lynette Sowell has written an awesome book and I highly recommend it to anyone who likes reading Amish and Mennonite fiction. Looking forward to reading A Path Made Plain (book 2) when it hits the bookstores and I hope there's more of Natalie and Jacob. I was provided a copy of this book by the publisher/author in exchange for my honest review. I really like Amish fiction but sometimes it can tend to have a lot of similarities from one book to the next. A Season of Change really breaks away from the normal and, for me, that really added to the appeal of the story. Natalie Bennett is a former aerial silks artist for the circus and now teaches kids and adults at the local circus school founded by her best friend, Grace Montgomery. She also goes to hospitals dressed as a clown to entertain sick children. She has recently discovered that her mother was Amish and when she meets Jacob and his family she feels drawn to them immediately. I really loved the circus aspect being included in the story. That is something I have never read in Amish fiction before. I found it to be a very interesting change and it really drew me into the story. Jacob Miller is a fairly recent widower and is being pressured by his family to marry again. Only he feels no connection or pull towards the traditional Amish girl they are trying to direct him to choose. Even though he feels there is no chance of a relationship with Natalie Bennett, she is the one he is drawn to. He loves the way Natalie is with his children and how much they love her in return. Jacob is a traditional Amish man. Quiet, not prone to displays of affection and very protective of his children. I loved his character and his quite charm. I also loved the way he doted on Rebecca while she was recovering. He was a model father and a very endearing character. I also loved the community of Pinecraft. It was so diverse and charming. I have never read about a place that had such a wide range of Amish and Mennonites. Some were very old order Amish that adhered to the traditional rules of their faith. But others were more lax with the rules and did things like having electricity, riding on the city buses, dressing in normal clothing and everywhere you looked they were riding bicycles. Not your average Amish on horse and buggy with long dresses, aprons and prayer kapp. I can't think of one thing I didn't like about this book. It literally renewed my interest in Amish fiction. I had gotten in a bit of a rut when it came to reading it but it made me look forward to my next book. The storyline is spot on. It's fun and lighthearted but at the same time it has all the depth you expect from Amish fiction. It puts a fun twist on the Amish faith and takes you to places you've never been. This is my first book by Lynette Sowell but I am definitely looking forward to the next book in this series. If you like Amish fiction with a slight twist on the traditional you'll love this book and I highly recommend it! When I realized A Season of Change took place in Pinecraft, I was even more excited than usual. You see, I live in a suburb of Tampa, Florida, which is just north of Sarasota- where Pinecraft is located! In fact, I've been to Yoder's Amish Village several times and can't wait to go back! The food at the restaurant is FABULOUS! Really--it's like the food your grandma used to make. Meatloaf, macaroni and cheese, apple butter for the fresh sliced bread, and lots of pie! Everything is homemade and n When I realized A Season of Change took place in Pinecraft, I was even more excited than usual. You see, I live in a suburb of Tampa, Florida, which is just north of Sarasota- where Pinecraft is located! I love to shop at their market and deli area. My favorite thing to buy, aside from everything, is their sweet mint tea! Around Christmas, I went there with my aunt and I forgot to order several gallons ahead of time, but they went ahead and made them for me as a special order. Talk about generous! I've eyed the pizza shop and Big Olaf's Ice Cream place, but haven't ventured in yet. Maybe in the fall when things cool down a bit and I can enjoy the outdoors without melting. Now that I've read more about the village area, I may even be a "tourist" and venture around a bit more to see if I can find some of the locations in the story. Jacob seemed like a lost little puppy with his children. With no wife to help with their care, I'm glad that his grandmother was able to help while they had their extended stay. Zeke seemed like a bright young boy and Rebecca seemed very mature for her age--although they'd been through a lot of heartache for being so young. I enjoyed reading about the developing friendship between Natalie and Jacob's family--especially when she learned that her own mother had been Amish and found part of a quilt she had started. I was a bit frustrated by the "rules" that Jacob had to follow--they remind me a bit of my grandmother's denomination--but I understand their reasoning and can see how it may not be a problem for him since he was raised with those beliefs. Of course, I was really excited to read about the developing feelings Jacob and Natalie had for one another, but I couldn't figure out a middle ground as Mammi had suggested because their worlds are so very different. I'm so glad that everything worked out in the end and I can't wait to read more about the other villagers! Hard to believe you might find a common ground with the life of a circus performer and an Amish family in the latest novel from author Lynette Sowell. Yet that is what you will find as the basic premise in A Season of Change in the first novel in the Seasons of Pinecraft series. Both of the main characters are going through their own "seasons of change" with being in Pinecraft, Florida, a place where the Amish generally come in the winter months from their towns up North. Jacob Miller had only p Hard to believe you might find a common ground with the life of a circus performer and an Amish family in the latest novel from author Lynette Sowell. Yet that is what you will find as the basic premise in A Season of Change in the first novel in the Seasons of Pinecraft series. Both of the main characters are going through their own "seasons of change" with being in Pinecraft, Florida, a place where the Amish generally come in the winter months from their towns up North. Jacob Miller had only planned on being in Pinecraft for two weeks to celebrate Christmas with his grandparents and in hoping to distance himself from the painful memories of losing his wife Hannah. Now it seems as if everyone expects him to move on and find a new wife, hopefully a young Amish girl like Betsy Yoder who has expressed more than a passing interest in Jacob. But when an unexpected accident he didn't plan or see coming lands his daughter in the hospital, it looks as if his stay in Pinecraft is going to be extended for quite some time. Miss Bubbles, the clown always loves to spend her free time visiting children that are stuck in the hospital during Christmas and this time is certainly no exception. What she doesn't plan on is finding an Amish family dealing with the miracle recovery of Rebecca Miller. She is confined to a hospital bed just grateful to be alive after being hit by a car she didn't see coming. Now it seems that happiness has found its way into her room, Natalie Bennett is utilizing her skills coming from the circus to dress up as a clown and bring smiles to the faces of children like Rebecca who are confined in the hospital. She is more than happy to make her smile and offers a small juggling lesson of oranges to both Rebecca and her brother Zeke who is beyond fascinated by Natalie. What she didn't plan on is falling head over heels for their father Jacob whose blue eyes can captivate and steal your heart. A Season of Change is a fascinating Amish story unlike any other! I've called Amish books 'unique' before, but this one definitely takes the cake. A romance between an Old Order Amish widower and a former circus performer? Who could imagine? Apparently Lynette Sowell could, and she does - well. Her writing is smooth, polished, and ripe with romantic possibilities between Jacob and Natalie. She brings Pinecraft to life, as well as the culture and the people who populate it, and that's a major plus A Season of Change is a fascinating Amish story unlike any other! I've called Amish books 'unique' before, but this one definitely takes the cake. A romance between an Old Order Amish widower and a former circus performer? Who could imagine? Apparently Lynette Sowell could, and she does - well. Her writing is smooth, polished, and ripe with romantic possibilities between Jacob and Natalie. She brings Pinecraft to life, as well as the culture and the people who populate it, and that's a major plus to the story. I've been hearing about Pinecraft for years, and Sowell makes the most of this different setting. This salad bowl of a village makes the perfect backdrop for describing the differences between bishops, sects, and cultures. While most romance stories make for fun reads in which you know that the two in question will get together, in A Season of Change you're never really sure. The differences are extreme and both people understand them. Agree with them. So while you're championing for them, it's not just when they will get together that you can't wait to determine, but really, how. That huge question leaves suspense simmering in your veins as you fly through chapter after chapter, intent on figuring it all out. The ending was a new one to me. Sowell wrapped everything up in a box I didn't anticipate - and that was fun. While the story itself was entertaining, though, and I loved the characters and writing style, parts of it didn't read as believable to me. These were minor things, for the most part, but as someone who likes to see a tight plot with all things fitting together well, this bothered me a bit. I don't like having unanswered questions. If Natalie's mom was raised Amish and didn't leave until she was nearly 18, how did she learn to be a circus performer? Most people practice those skills their entire lives. What happened to give her that sort of desire - and how could she have learned it? What happened to her between the time she left her family and she joined the circus? I would love the answers to those questions. Actually, it might make a pretty neat story - and it would be no more out there than this one. I'm kinda torn with this one. I love Amish I love circus so I thought this was gonna be my kinda book. And in some ways it was and in some ways it wasn't. I had a really hard time getting into the plot. For me the pace fluctuated from REALLY good scenes to filler that caused the pace and my attention to slip. There was a little too much grief and death for me in the beginning, but by the end the joy and messages of God's will and love overcame them. The kids captured my heart completely and almo I'm kinda torn with this one. I love Amish I love circus so I thought this was gonna be my kinda book. And in some ways it was and in some ways it wasn't. I had a really hard time getting into the plot. For me the pace fluctuated from REALLY good scenes to filler that caused the pace and my attention to slip. There was a little too much grief and death for me in the beginning, but by the end the joy and messages of God's will and love overcame them. The kids captured my heart completely and almost immediately (they probably were at the top of my list of favorite characters in the whole book)! The typos got a little frustrating at times and there were a couple of times where the story got confusing. Example: one character asks another to go and get pizza for them all from the local pizza place; then later on in the story the same character says she'd never had pizza from the local place. So there were these editing issues that I hope get fixed for future prints. I absolutely LOVED the messages! They range from remembering we answer to God and not to man; to acknowledging somethings in the Amish faith. And I really enjoyed the addition of a quilt which kinda made it have the feelings of Abingdon Presses other Quilt's of Love series. I do wish there was a little more circus actually in the book than there is. There's some but I wanted more. But the the things I learned about the Amish, Mennonites, and Pinecraft in Florida made me happy I'd read A Season of Change. Overall I felt this is a highly interesting read, with a great love story that really touched my heart, and is filled with great pieces. The is not your typical love story. Our second character is Natalie Bennett known as Bubbles the Clown. She is also searching for her own way. She is Englisch. She has lost her mother and her father has a new family and doesn't really have time for Natalie. One day she receives an unusual box from her father, that sends Natalie on a search for answers about the contents of the box. She ends up in Pinecraft. Is this place her future or her past? When you read Amish books, I get the feeling that they don't question, they just follow and do. In this book, we have characters that are questioning things in their lives. They know it isn't right to ask but we have characters here that do ask. Jacob and Natalie want to follow God's will. Will Jacob and Natalie end up together or will Jacob marry for convenience, not Love? We have two people who cannot and will not ask the other to give up their world. Will there be a compromise? This book is set aside from other Amish reads in my opinion. It approaches Amish life in a different way. It goes against some of their beliefs ad ways. Nice change. Another wonderful Amish book to add to any one's collection. I know it is on my shelf. I would hope that anyone who loves a good Amish book or just a book that takes a different outlook on the Amish ways, to get a copy and read it. You will find yourself engaged in Jacob and Natalie's worlds. My Thoughts About The Book: I have a love of Amish fiction, especially good Amish fiction, and am delighted that so many Amish fiction authors are out there right now. I was taken aback because A Season of Change is so very different from any other Amish stories I have read to date. The story opens with Jacob Miller, an Amish widower who meets an Englisher, Natalie(a clown), while she is visiting the children's wing of the hospital where his daughter is. I would never have placed circus people and Amish together so this made the story a bit far fetched in the beginning. Reading this was a first because I have never read any Amish books that take place in Florida. Most Amish books are set in Pennsylvania, Ohio, Indiana. The Florida Order has very relaxed rules and so I did some research on this community and found that one like it really does exist. As a Floridian who grew up with "snow birds" visiting in the winter I became more comfortable with the location of the story once I had some background information. Even with the setting and the relaxing of the rules I still found the familiar Amish themes, emotions and dilemmas faced by the various personalities were well portrayed and the end result is quite unexpected. I could not put it down and it was a most enjoyable read. Sowell is quite the wordsmith and tells the story in a genuine manner and I loved it. A Season of Change is the first in a series, and I cannot wait to read more by this author. If you are a fan of Amish fiction this is a must read. Be prepared though because it is off the beat and path of regular Amish romances. A Season of Change is set in the Plain community of Pinecraft, Florida. Where both Amish and Mennonites vacation, and some live and/or retire there as well. And it is where we meet Jacob Miller and Natalie Bennett. Natalie Bennett is a former aerial silks artist for the circus and now teaches kids and adults at the local circus school. She also visits the areas hospitals dressed as Bubbles the Clown to entertain sick children and their families. She has recently discovered that her mother had been raised Amish and when she meets Jacob and his family during one of her hospital visits she is drawn to them. I enjoyed this story very much, and while the setting was different than in most Amish novels, it worked very well. The characters were realistic, and faced real trials. I also enjoyed the time I spend in Pinecraft, and even though I have never been there the scenes where described so well that I could picture the city as I walked through Pinecraft with the characters. I look forward to visiting Pinecraft again when I read the next book in Seasons in Pinecraft series A Path Made Plain . ** A Season of Change by Lynette Sowell was provided for me free by Litfuse Publicity Group in exchange for my honest review. the story of Jacob Miller and Natalie Bennett. Jacob Miller had only planned on being in Pinecraft for two weeks to celebrate Christmas with his grandparents and his two children in hoping to distance himself from the painful memories of losing his wife Hannah and newborn son. Now it seems as if everyone expects him to move on and find a new wife, hopefully a young Amish girl like Betsy Yoder who has expressed more than a passing interest in Jacob. Jacob Miller’s daughter is injured and hospitalized while on vacation in Pinecraft, Florida. Because of her injures he will be there for an extended period of time. Can a past filled with loss lead to a new season of life? Stranded at a Sarasota hospital at the bedside of his ailing daughter, Amish widower Jacob Miller is wary of his unfamiliar surroundings—including the strange curiosity of Englischer Natalie Bennett.They meet when Jacob's little daughter is in the hospital after being hit by a car, and Natalie is visiting the children's wing dressed as a clown. Natalie, an aerial silks artist whose career in the circus ended before it began. She is an English woman searching for her path. Set adrift with her Mother's passing and her Father's attention on his new family, an unusual box from her Father sets Natalie on her own search. She has lived in Sarasota, Florida but has never been to Pinecraft. Has she found her past or possibly her future? Why did Natalie’s mother who was once Amish keep this secret for so long? Does Natalie still have Amish relatives? How can she learn more about her heritage? is there hope for a relationship between an Christian Englisher and an Amish? A Season of Change is a wonderful well written 4 stars book. I am looking forward to reading more books by Lynette Sowell. Amish Widower, Jacob Miller intended for his visit to Sarasota Florida to be a short one but when his young daughter is injured his stay there becomes much longer than he expected. Natalie Bennett is still mourning the loss of her mother when she receives startling news - her mother was once Amish. Natalie is filled with questions about the Amish and thinks the Millers might be able to help her find any relatives she may have. Jacob and Natalie start to grow close but love between Amish man and Amish Widower, Jacob Miller intended for his visit to Sarasota Florida to be a short one but when his young daughter is injured his stay there becomes much longer than he expected. Natalie Bennett is still mourning the loss of her mother when she receives startling news - her mother was once Amish. Natalie is filled with questions about the Amish and thinks the Millers might be able to help her find any relatives she may have. Jacob and Natalie start to grow close but love between Amish man and an English woman is forbidden. Will they find a way to follow their hearts? Set in Florida where some Amish go for the winter and some even live there year-round, “Season of Change” is one of the most unique Amish romance novels I've read and I've read a lot of them. Most of the Amish romances I've read take place in Pennsylvania or Ohio so it was interesting to read about the Amish in Florida who are not afraid to bend the rules a bit while there including using electricity. Jacob’s story is heartbreaking as he mourns the loss of his wife and struggles not only to raise his two children but with the pressure from other Amish to finding another wife and mother for his children. Natalie’s story is heartbreaking in its own way - she is mourning the loss of her mother and feeling a need for family that her father can't give her. Her search for her Amish family is well done. Also well done is the growing attraction between Jacob and Natalie - they know in their romance it is forbidden but their hearts tell him otherwise. The one thing that kept me from getting this book five stars is the resolution to the story. After all the buildup the ending felt rushed and the choices Natalie and Jacob made didn't feel well thought out and the resolution felt like it should have been developed more. The ending aside, I enjoyed this book I look forward to the next book in the series. Lynette Sowell writes a love story like no other. Typical love stories plot along with the two parties falling in love the conventional way. However, the two people in this love story are far from typical. In the Amish world, many say "What happens in Pinecraft stays in Pinecraft". Jacob is an Old Order Amish who decided to visit Pinecraft, Florida with his two children. Having lost his wife and newborn son, he is struggling to find his way. He has questions which he knows he should not ask acco Lynette Sowell writes a love story like no other. Typical love stories plot along with the two parties falling in love the conventional way. However, the two people in this love story are far from typical. In the Amish world, many say "What happens in Pinecraft stays in Pinecraft". Jacob is an Old Order Amish who decided to visit Pinecraft, Florida with his two children. Having lost his wife and newborn son, he is struggling to find his way. He has questions which he knows he should not ask according to his Bishop, family and community. Feeling pressure to remarry, Jacob wants to marry for love and not convenience but is afraid. Enter Natalie Bennett aka: Bubbles the clown. She is an English woman searching for her path. Set adrift with her Mother's passing and her Father's attention on his new family, an unusual box from her Father sets Natalie on her own search. She has lived in Sarasota, Florida but has never been to Pinecraft. Has she found her past or possibly her future? I loved how Ms. Sowell had Jacob questioning. So many times in Amish books, we see the characters just follow the rules and not question. Jacob has questions. Even though he knows he should not ask, he does anyway. Both Jacob and Natalie want to follow God's lead, even if that means not being together. Both are willing to sacrifice happiness and love for the other. They want what is God's path. Natalie cannot ask Jacob to give up his world. Jacob cannot ask Natalie to give up hers. Is there a middle path? Is there a compromise? With help from some of the people in Pinecraft, Sarasota, and Ohio, can this middle ground be reached? Makes we remember: "If you love something set it free". Will these two be willing, if it is God's will, to set each other free? A Season of Change is book one in The Seasons of Pinecraft by Lynette Sowell and I loved it. As my readers know Amish Fiction is my favorite genre and this book did not disappoint. I have never had the pleasure of reading books by Lynette Sowell but now I have a new author on my list to read. A Season of Change is definitely not a typical Amish fiction book especially since our main character is a teacher at the circus school in Sarasota. Lynette Sowell writes with authority on Amish faith, Pine A Season of Change is book one in The Seasons of Pinecraft by Lynette Sowell and I loved it. As my readers know Amish Fiction is my favorite genre and this book did not disappoint. I have never had the pleasure of reading books by Lynette Sowell but now I have a new author on my list to read. A Season of Change is definitely not a typical Amish fiction book especially since our main character is a teacher at the circus school in Sarasota. Lynette Sowell writes with authority on Amish faith, Pinecraft, circus life, and Mennonite faith. I really enjoyed learning more about the Pinecraft area and how all the different faiths live and work together in that area. I enjoyed all the characters in this book especially Natalie's desire to give back to the children at the hospital and her search for family and where she belongs really spoke to me. I loved learning about the circus! I really felt like I was there watching events unfold from Lynette Sowell's vivid descriptions. I found myself laughing out loud in parts and crying in others, especially as Natalie works through trying to find her family and who she is. I could not put this book down, from start to finish it kept my interest and kept me wanting more. I cannot wait to read more in this series! I highly recommend this book to anyone who enjoys Amish Fiction, you won't be disappointed! If you have not read Lynette Sowell, I recommend you do! I look forward to reading more from Lynette Sowell. I give this book 4.5 STARS. I know it really has no bearing on the story but I’m always thinking about how the writer imparts the actual Amish culture and I feel like the cover has a lot to do with that and I really love how you can see the face of the young woman who What an intriguing new series. A Season of Change can only be described as a breath of fresh air. Amish widower Jacob Miller’s daughter is injured and hospitalized while on vacation in Pinecraft, Florida. Because of her injures he will be there for an extended period of time. Bubbles the clown AKA Natalie Bennett befriends the Miller children and family. As Jacob and Natalie develop feeling for one another they think there is no hope for a relationship between an Christian Englisher and an Amish. The author Lynette Sowell did a great job with the contrast between the life of the Amish, the plain people and the life of a Christian. I really enjoyed reading about the similar and differences in their beliefs. I found answers to question I had in the back of my mind about their beliefs. A Season of Change is deserving of 5 stars. I highly recommend this book to all who enjoy Amish fiction, Christian fiction and clean romances. It is a super book. A Season of Change is book one in the Seasons in Pinecraft Series. I look forward to the next book. This is the first book I have read by author Lynette Sowell, I loved her writing style and look forward to read more book by her. I thoroughly enjoyed this Amish/English novel! Pinecraft was such a fascinating place with interesting people, Amish and English alike! What attracted me originally to this novel was Natalie's job with the circus and her involvement with the Millers. I was definitely not disappointed! It was mind-blowing to me in reading about an Amish community in Florida and the different groups of Amish there! It was even more awesome to see how they embraced Natalie who was not even Plain as if she was no di I thoroughly enjoyed this Amish/English novel! Pinecraft was such a fascinating place with interesting people, Amish and English alike! What attracted me originally to this novel was Natalie's job with the circus and her involvement with the Millers. I was definitely not disappointed! It was mind-blowing to me in reading about an Amish community in Florida and the different groups of Amish there! It was even more awesome to see how they embraced Natalie who was not even Plain as if she was no different then a fellow member of the Amish society! I absolutely fell in love with Rebecca and Zeke, Jacob's children! They sounded so adorable even if they did get into a little bit of mischief! Natalie was one of my favorite characters too with her thoughtful ways, but with an outgoing personality! Jacob was a little bit harder for me to relate to since he had so much on his plate! It was interesting to hear his story and the questions he had concerning faith! Overall, I really enjoyed this unique story! I learned a lot about the Amish community in Florida as well as the importance to trust God to work out everything according to His will! We just have to trust Him and thank Him for friends that help us along the way as they did for Natalie and Jacob! I give A Season of Change by Lynette Sowell a 5 out of 5 stars! Just picking up this book, I couldn’t imagine what was between its covers, but it intrigued me, and so glad I read it. You read the back of the book and find out that Jacob Miller is a widower with young children, and still mourning his wife. Also he travels to Pinecraft Florida, which I’ve heard of, with a lot of trepidation, and as it turns out it is good and bad that he is there. Jacobs’s path crosses with Natalie Bennett, and Englisher and former circus performer, as she visits the hospital Just picking up this book, I couldn’t imagine what was between its covers, but it intrigued me, and so glad I read it. You read the back of the book and find out that Jacob Miller is a widower with young children, and still mourning his wife. Also he travels to Pinecraft Florida, which I’ve heard of, with a lot of trepidation, and as it turns out it is good and bad that he is there. Jacobs’s path crosses with Natalie Bennett, and Englisher and former circus performer, as she visits the hospital dressed as a clown to help cheer the children. Not exactly how you picture a strict Amish man and a circus/clown meeting, and becoming intertwined in their lives. Now Jacob’s community is pressuring him to remarry and present a mother for his children Zeke and Rebecca. There is a young woman who is also visiting Florida that would love to take that position, but Jacob is not interested. You know of course, who he and the children choose, yes, Natalie, but can that ever be? Who will be willing to give up all they know, and are familiar with? There are some really big surprises here, and some you will never see coming. I sure didn’t! There are other characters we meet and fall in love with, and I am so happy that they were there and enriched the book. Be ready for a really wonderful and loving read and a very different love story! I received this book through Litfuse Publicity Book Tours and Abingdon Press, and was not required to give a positive review. I first decided to review this book because it was an Amish book (which I love) placed in a non-Amish place: Florida (which I also love!). I thought it would be interesting to read about how the Amish people interacted outside of their communities. I didn’t know there was a large Mennonite and Amish population in Sarasota, Florida, so that captivated me. I also enjoyed reading about the subtle and not-so-subtle differences between the two groups of people. However, children from any religious bac I first decided to review this book because it was an Amish book (which I love) placed in a non-Amish place: Florida (which I also love!). I thought it would be interesting to read about how the Amish people interacted outside of their communities. I didn’t know there was a large Mennonite and Amish population in Sarasota, Florida, so that captivated me. I also enjoyed reading about the subtle and not-so-subtle differences between the two groups of people. However, children from any religious background have many similarities and I liked to see that shine through in Rebecca and Zeke. Also fascinating was the competition between Natalie and a young Amish girl, Betsy, who is more than willing to step into the spot left by the death of Jacob’s wife. While there is no out-and-out brawling, the tension is pretty thick at many points. I applaud Sowell’s creation of this dynamic between the two women who both yearn to be part of Jacob’s life. Book 2 in the series, A Path Made Plain, is set for release in November of this year. This book focuses on Betsy and is one I’ll be sure to read even if it’s not part of a book tour! Betsy is a baker and I can’t wait to read all about her delicious creations. Knowing next to nothing about Amish and Mennonite culture myself, Lynette Sowell offers a unique glimpse into the day-to-day lives of various sects. What I appreciate about Sowell’s storytelling is she presents the religious dichotomies in a conversational and understandable manner, without sounding overly academic. I had no idea of the Pinecraft community’s existence, but thoroughly enjoyed learning about the Amish version of Las Vegas. I think A Season of Change will dispel certain stereotypes Knowing next to nothing about Amish and Mennonite culture myself, Lynette Sowell offers a unique glimpse into the day-to-day lives of various sects. What I appreciate about Sowell’s storytelling is she presents the religious dichotomies in a conversational and understandable manner, without sounding overly academic. I had no idea of the Pinecraft community’s existence, but thoroughly enjoyed learning about the Amish version of Las Vegas. I think A Season of Change will dispel certain stereotypes about Amish and Englisch cultures alike. The idea was unique and piqued my interest (Amish man falling for a non-Amish woman); however, the overall execution fell short. I can understand why Jacob’s demeanor was sometimes cold and distant – it’s a product of his upbringing. However, at times, I felt like the dialogue was too stiff and not believable for Natalie, our young twenty-something heroine. Also, I was bothered by how much time was spent on Jacob’s grief over his late wife. Yes, we know he is still in mourning, but I felt like the first third of the book was an homage to his wife – which, as a reader, was a bit overwhelming. Stranded at a Sarasota hospital at the bedside of his ailing daughter, Amish widower Jacob Miller is wary of his unfamiliar surroundings--including the strange curiosity of Englischer Natalie Bennett. Natalie, an aerial silks artist whose career in the circus ended before it began, has just uncovered a secret her mother kept hidden for years. Her mom--or rather, mamm--was once Amish. A hundred questions suddenly surface. Why did Natalie's mother keep this secret for so long? Does Natalie still have Amish relatives? How can she learn more about her heritage? Can Jacob trust Natalie's piqued interest in his family and their simple ways, or will their clashing cultures thwart their hopes for finding the love of a family? Jacob Miller is a young Amish widower with 2 little children, Rebecca and Zeke (Ezekiel). He takes a trip to Pinecraft, Florida to visit his grandparents. Sweet little Rebecca suffers a broken leg in a car accident. At the hospital she meets Bubbles the Clown also known as Natalie Bennett. Natalie is a former circus aerial silks artist and a circus teacher. Natalie befriends the Miller family and she sees their faith and also longs for the close family relationship they have. Jacob and Natalie have Jacob Miller is a young Amish widower with 2 little children, Rebecca and Zeke (Ezekiel). He takes a trip to Pinecraft, Florida to visit his grandparents. Discovering a long lost secret that her deceased mother was Amish, Natalie sets out to find her family. Natalie goes to Ohio and locates her family. She develops a sense of belonging which has been missing in her life. Can people from two different worlds compromise and make sacrifices for love? Themes in the book were faith and family, seeking Gods will for their lives and answering only to God and not to a bishop, the Order etc. for their choices and decisions. I loved the ending and this book offers a great glimpse into life in Pinecraft, Florida. This was a good one. Natalie is a former circus performer who has recently learned her mother was born into an Amish family. Jacob's daughter is hit by a car and in the hospital. Natalie meets Jacob at the hospital where she is dressed as a clown. She wants to know more about her ancestors and is intrigued by Jacob. As the two of them become close, they realize how differently they live. I had a little trouble getting into this book, but once I 'clicked' into it, I really enjoyed it. I liked Nata This was a good one. Natalie is a former circus performer who has recently learned her mother was born into an Amish family. Jacob's daughter is hit by a car and in the hospital. Natalie meets Jacob at the hospital where she is dressed as a clown. She wants to know more about her ancestors and is intrigued by Jacob. As the two of them become close, they realize how differently they live. I had a little trouble getting into this book, but once I 'clicked' into it, I really enjoyed it. I liked Natalie and how different her life has been in the circus. The author does a great job with the character interactions and I would honestly really enjoy going to visit the community she describes. Jacob is a good dad (and that in and of itself is a great character). The story flowed well once I got into it and I will happily go back and visit this place in future books of hers! I rate it a 4/5, it is a good Amish romance. If you're looking for a unique Amish story, look no further! Not only is the setting a little different than most, but a character who's a former circus performer is pretty rare for any type of book! I really liked the more relaxed atmosphere where there's a mix of English, Amish and Mennonite cultures. I found Natalie's life to be very interesting, from her job teaching at a circus school to her search for her Amish family. Jacob and Natalie have a reluctant relationship where they're drawn to If you're looking for a unique Amish story, look no further! Not only is the setting a little different than most, but a character who's a former circus performer is pretty rare for any type of book! I really liked the more relaxed atmosphere where there's a mix of English, Amish and Mennonite cultures. I found Natalie's life to be very interesting, from her job teaching at a circus school to her search for her Amish family. Jacob and Natalie have a reluctant relationship where they're drawn to each other, but know it could never work, at least how their lives are now. I did think it seemed a bit soon for Jacob to be interested in another woman since it had only been six months. I liked some of his honest struggles about wondering if his wife was in heaven and the discussion he had with a Mennonite friend about faith vs. works. I enjoyed the various perspectives in the story and this definitely kept my interest throughout. You should definitely check it out if you like Amish stories! Amish Jacob Miller is a widower with two small children that goes to the winter Amish/Mennonite resort town of Pinecraft, Florida. So far...okay. But then, after an auto/pedestrian accident that involves his seven year-old daughter, Jacob and his family meet former aerial silks circus performer (and non-Amish) Natalie Bennett and sparks fly. I can't imagine an odder pairing. I loved all the Amish and Mennonite details included in the story and liked reading about Pinecraft. But I guess I prefer Amish romances and Amish stories in general that are Amish/Amish rather than Amish/Englisch. It just seems to me that the compromises that are made would compromise long-held beliefs. The story is well-told and jam packed full of Amish "light" details. I just would have preferred a romance with Jacob and Natalie focused on romantic partners within their own belief system. "5 out of 5 stars!! This engaging novel will win you over with it's compelling story, about what your faith really means to you and what you're willing to change about yourself or possibly give up so you can openly love the person your falling for. I really liked how this novel gives you a different look into Amish romance while being as accurate, as can be, about some of the struggles that the Amish have to deal with if they happen to fall in love with someone not of their religion." Read more o "5 out of 5 stars!! This engaging novel will win you over with it's compelling story, about what your faith really means to you and what you're willing to change about yourself or possibly give up so you can openly love the person your falling for. I really liked how this novel gives you a different look into Amish romance while being as accurate, as can be, about some of the struggles that the Amish have to deal with if they happen to fall in love with someone not of their religion."